As the heart and soul of your home, the kitchen should stand out in both beauty and functionality. After all, most families spend the majority of their time in and around the kitchen: cooking, entertaining, cleaning, chatting, and yes, searching the refrigerator for a late-night snack. The cabinets that frame your kitchen say a lot about you and your style. If that style is outdated and in need of a facelift, new cabinets are an effective way to refresh this most important room in the house. Choosing kitchen cabinets in Corona CA that are unique and striking will transform the whole room from boring to beautiful. Check out these 10 signs that it’s time to invest in new kitchen cabinets. If your countertop is housing more items than your cupboards, you have a problem. Your countertops should be open and free for meal preparation and only the most basic of necessities, such as coffee makers or a cookie jar. Additional cabinets can increase your storage capacity exponentially so you can re-claim your counter space. A big complaint among homeowners who are lacking cabinet space isn’t just that there’s not enough – it’s because the whole flow of the cabinets doesn’t make sense in that space. With custom kitchen cabinets in Corona CA, however, you don’t have to accept traditional sizing configurations. You can switch up the height, depth or width of the cabinet based on your needs so everything flows smoothly. Where your cabinets are located in the kitchen can make or break how efficient you are. They should be configured to accommodate your storage needs, but also designed in a way that makes working in your kitchen easier. Having a cabinet for your pasta pot across the room from your stove can be very inconvenient. Likewise, having your cabinet of glasses well away from the refrigerator can also pose a logistical problem. We all expect to clean our kitchen every day. Crumbs accumulate, things get spilled, etc. But when you find yourself constantly wiping down cabinets on top of your standard cleaning tasks, it could be time for an upgrade. For example, the stainless steel-lined cabinets you loved when you first moved in as a newlywed have become a cleaning nightmare now that you have toddlers who leave handprints all over them. In this case, you may want to upgrade to treated wood for easier cleanup. Are you constantly failing the full-hands test? Let’s say you have a package of chicken in one hand and a can of spaghetti sauce in the other… is it easy to open and close your cabinets to get what you need? Or do you have to put something down to do it? Your cabinets should be able to open and close with ease, without sticking and giving you trouble. Plus, with today’s modern options, from hardware to smart features, you should be able to operate your cabinets with the slightest touch. If your kitchen screams 1990, it’s time to get modern with cabinets that are more reflective of today’s designs. From Wide Shaker Espresso Cabinets to Mitered Charcoal Kitchen Cabinets, it’s easy to bring your kitchen smoothly into 2018 and beyond. Cabinets aren’t what they used to be: simple cupboards that housed dishes and cups. Today’s options give you features like mini-wine racks, a modern spin on the Lazy Susan, oversized drawers, stemware racks, glass display cabinets, built-in spice racks, drawer organizers and oversized drawers for baking sheets. No sense in cramming your odd-sized pots, pans, accessories and spices in places they don’t fit. Customize your cabinets to what you want! One of the biggest reasons homeowners decide to upgrade their cabinets is because their old ones are suffering from wear and tear. From creaky, rusting hinges to faded exteriors, your old cabinets are dragging down the appearance of your kitchen – even if the rest of the space is semi-modern. With your new cabinets, consider the quality of hinges, doors, drawer systems and finishes. Sometimes you just want something cool in your kitchen that inspires those “wow” comments from guests. With new cabinetry, you can include cool hidden conveniences like this built-in refrigerator, cleverly disguised as part of the cabinetry. Especially if you have a small kitchen, too many bulky cabinets can quickly overwhelm the room. In order to streamline the space, ditch the clutter and add just a few materials, such as tall, dark cabinetry offset by limestone backsplashes and a stainless steel counter to maintain a feeling of openness. 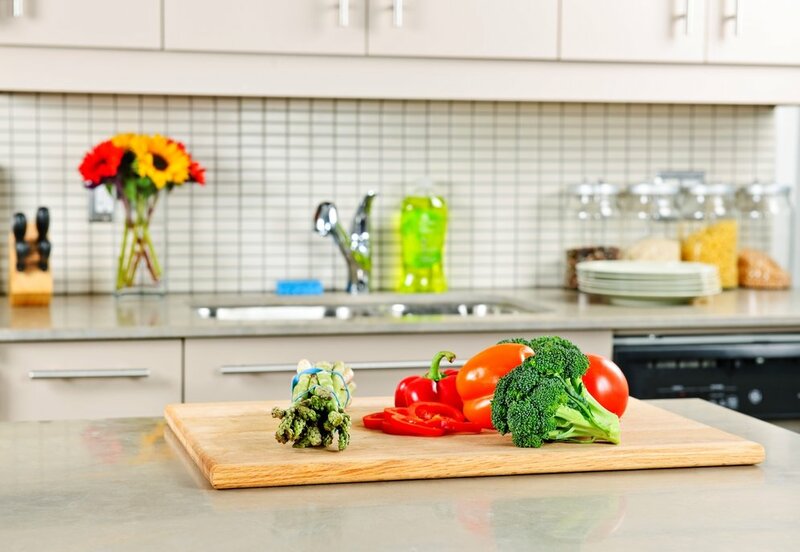 Adding contrasting hardware gives your kitchen a sense of grand scale, says Good Housekeeping. Is it time for you to invest in new kitchen cabinets in Corona CA? 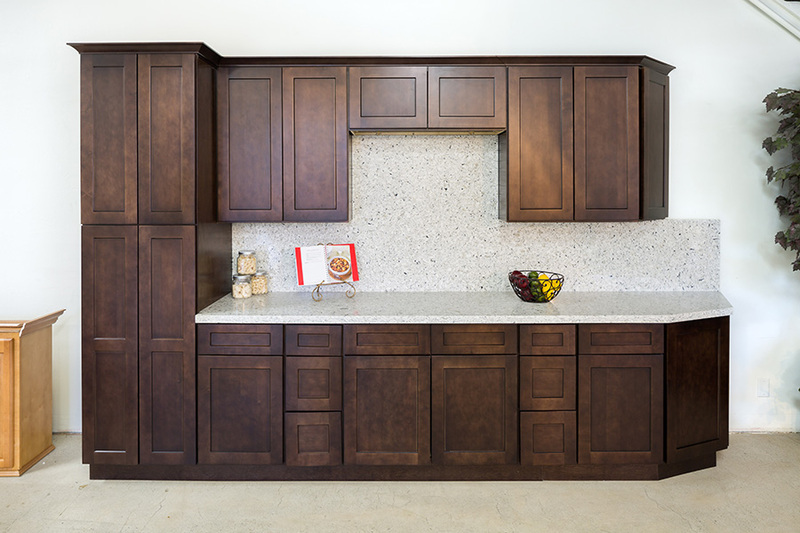 Call Summit Cabinets at 909-980-0700 or fill out our online form for a Free Kitchen Design today.